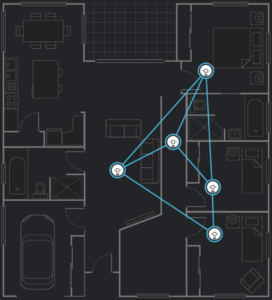 With interconnected alarms, you will be alerted no matter where you are, or where the fire starts. Imagine that a fire breaks out at the opposite end of the house. 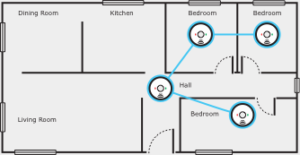 With interconnected alarms you can be alerted to the danger before its to late. 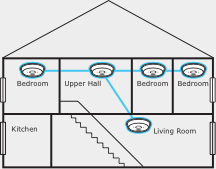 All private homes, townhouses and units will require hardwired photoelectric, interconnected smoke alarms. If a hardwired smoke alarm cannot be installed, non-removable 10-year battery smoke alarms can be installed in place. Photoelectric alarms, also known as optical or photo-optical, detect visible particles of combustion and respond to a wide range of fires. ionisation smoke alarms be replaced with photoelectric type as soon as possible. Existing landlord’s and tenant’s obligations continue. Property sellers must continue to lodge a Form 24 stating the requirements of the legislation have been met. See New Smoke Alarm Legislation for more details. All homes or units being sold or leased, or existing leases renewed, will require the installation of hardwired photoelectric, interconnected smoke alarms. If a hardwired smoke alarm cannot be installed, non-removable 10-year battery smoke alarms can be installed in place. Be hardwired to the mains power supply with a backup power source (i.e. battery), although dwellings which were existing prior to 1 Jan 2017 can be hardwired or powered by a non-removable 10-year battery, or a combination of both. If a smoke alarm which is hardwired to the domestic power supply needs replacement, it must be replaced with a hardwired photoelectric smoke alarm. All new homes or units and substantially renovated homes or units that are subject to a building application submitted from 1 January 2017, will require the installation of hardwired, photoelectric interconnected smoke alarms. Smoke alarms must be hardwired, or for existing dwellings, they can also be powered by a non-removable 10-year battery. Photoelectric smoke alarms, also known as optical or photo-optical, detect visible particles of combustion. They respond to a wide range of fires, but are particularly responsive to smouldering fires and the dense smoke given off by foam-filled furnishings or overheated PVC wiring. Your protection against fire increases with the quality and type of smoke alarm that is installed. Research indicates that photoelectric smoke alarms are generally more effective across a wider range of fires experienced in homes.